Rats and Rogues | SPACE-BIFF! Plaid Hat Games seems determined to win some sort of Best-Game-Quality-to-Company-Size-Ratio Award or something. Frankly, they were doing a great job of it with just Summoner Wars and City of Remnants, which has more mechanics crammed into one spot than an auto repair convention. 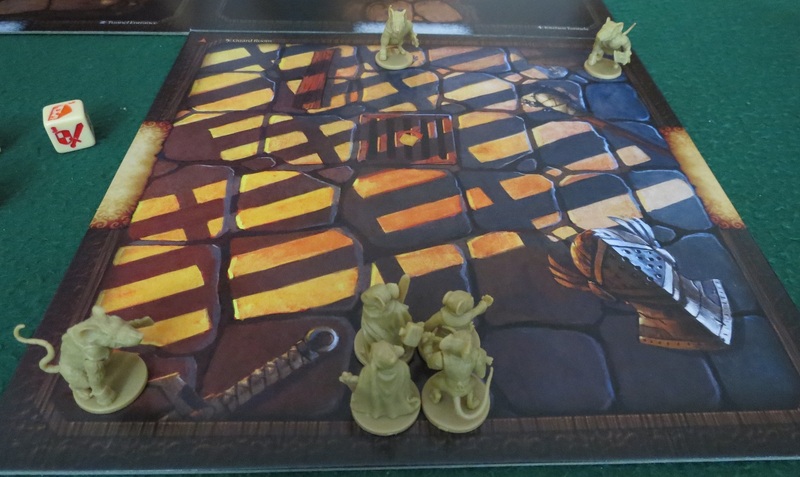 Even Dungeon Run, far and away their weakest game, is still pretty solid, with enough of a twist to set it apart from all the other dungeon crawls on the market. 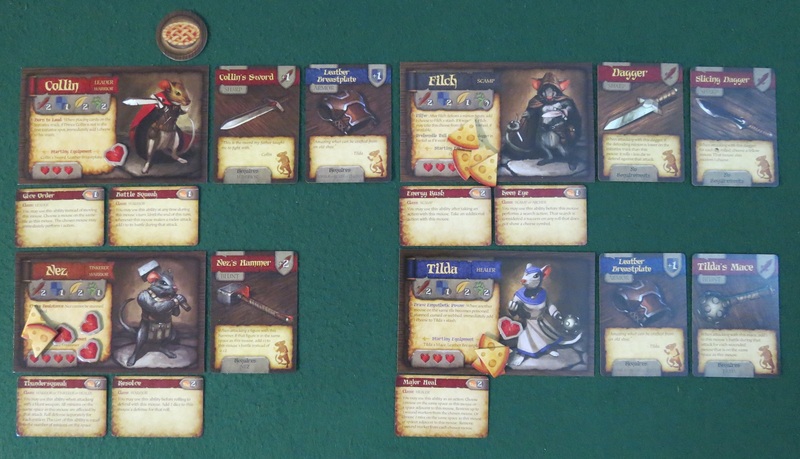 Enter Mice and Mystics, a story-based dungeon crawl-style game about a pack of too-cute mice on a quest to reverse the curse of an evil queen. It’s already won everybody’s hearts, penned a heap of glowing reviews, and garnered a whole bunch of awards — including the Dice Tower “Best Small Publisher” Award, which I suppose means Plaid Hat has accomplished its goal and must now blast off into the far reaches of space until the day it’s needed once more. But I digress. The popularity of Mice and Mystics is reason enough for me to not cover it, since I like writing about niche titles my readers may not have heard about, but my recent reentry into its brilliant campaign has forced my hand, and I feel compelled to point out some of the things I like best about it. The story itself doesn’t seem like much at first. In fact, the first impression it leaves is reminiscent of an over-trod hiking trail, eroded by decades of fairy-tale stepmother-distrust, improbable friendships, “learn the true meaning of courage”-isms, Redwall, and tired characterizations (“No one asked you, scamp,” is basically strongmouse Nez’s first line, directed at the rogue of the group because he’s, well, saving them). But let’s put that aside for a minute, because Mice and Mystics has a few amazing things going for it. First of all, the story might begin with some easy clichés, but it has a lot more fun with its tropes than I initially anticipated, and the narrative eventually branches into paths unexpected. Better yet, all that story stuff — and there’s plenty, complete with well-padded introductions and conclusions to each chapter, and extra paragraphs popping up between rooms and encounters — has a tangible impact on the gameplay. The tense escapes are tense escapes, the desperate battles are desperate battles, and the quieter moments are appropriately quieter. The game even has fairly robust rules for things like a pouncing feline or a stalking crow. Second, the writing is great. Seriously. I mean, it’s not The Brothers Karamazov or anything, and it occasionally falls prey to the above-mentioned simplistic characterizations, but it’s the best writing I’ve seen in a boardgame. Easily. Lastly, it’s drowning in charm. From the first moment where your mice escape a pack of enemy rats by jumping down through a grate into the sewer below, to… well, we’ll talk about some of the other scenes in a minute. It isn’t. I’m not saying it’s bad for kids. It’s fine. Really. It’s just that they’re going to need your help to get through it, because the instant your team of mice escapes the guard room through the grate in the floor and crashes into the sewer below, you’re going to have to start making some tough decisions. If you don’t climb out of there, the current is going to sweep you away, but the shores are teeming with enemies happy to take a piece out of you. The decision whether to fight in the flow or to sacrifice some actions to move out of the water is agonizing, and it’s hardly the only consideration. Mice and Mystics is satisfyingly tough. A lot of the resolution of the game’s encounters comes down to rolling dice, from attacks versus armor to how many extra spaces each mouse can move each turn, but the real challenge comes in figuring out how to best use your mice’s abilities to turn chance to your advantage. To illustrate, let’s talk about the cheese. And by that I mean literal cheese, not the story’s weaker elements. There are a few different elements on the dice — regular and ranged attacks, armor symbols for defense, movement numbers. And cheese. See, when you whiff and attack or defense, it might be because you rolled the cheese symbol instead of a sword. And when that happens, instead of cursing the dice gods and calling their wrath down upon your head even more surely, you’ll offer a little prayer of thanks, because you just added another sliver of cheese to your inventory. Cheese fuels all sorts of useful stuff. You can spend it on abilities, turning Tilda into a powerful healer or Nez into a rat-sundering wrecking ball. Cheese can make Collin grow from a plucky prince into an actual leader who can order other mice to take extra actions. Filch can suddenly make good on his name by automatically succeeding his room searches. Magos can cast helpful spells. Or you can save up your cheese to spend it all at once on buying a new ability. Your mice never really “level up” — they never gain extra attacks or life — but the versatility of new abilities can be instrumental in tackling different situations. For instance, outfitting Nez with Thundersqeak so he can spend some cheddar to mess up a bunch of greedy roaches, and Resolve so that he can survive their attacks better, then having Tilda spend a couple slivers of gruyère to salve his wounds is a glorious extra layer of complexity that rewards setbacks instead of punishing them. I guarantee your kids are going to need help figuring that out, and that means this isn’t the game that’s going to bore your brain right out of your skull every time they ask to play it. Battling for control of the kitchen! By that, I mean they’re loaded. The first chapter alone has a whole mess of stages. I’ve already mentioned escaping the guard room and the sewer (and it’s nothing short of wonderful the way you flip tiles over to reveal the other side; for instance, you jump down the guard room’s grate, then flip the tile over to reveal the sewer you just dropped into. This is light tactile gaming at its best), but even after that and after wandering through some infested rat-tunnels, you have a choice to make. Not an easy choice, like which enemy to attack first or whether to spend your cheese to heal now or later, but an actual gut-wrenching, life-altering decision. From the kitchen above, you hear Miz Maggie, the castle cook, scream. Do you go help her, or continue on with your escape? Now, before you assume this is an easy decision (“Save her for the experience points… I mean, the cheese!”), I can assure you it’s not. See, while you’re happily gathering cheese-crumbs to power your abilities and purchase new skills, the enemy is doing the same — evil casu marzu to your heroic mozzarella. When bad guys roll cheese during combat, or at the end of each round once all enemies have been defeated, they get a sliver of their own. And once they have enough, more enemies appear to bog you down. Time is always against you, and spending a few extra rounds to explore a room can cause a fatal wave of rat warriors to catch up, let alone going on an unnecessary side-quest. Turns out, the fight to save Miz Maggie in the kitchen is grueling. 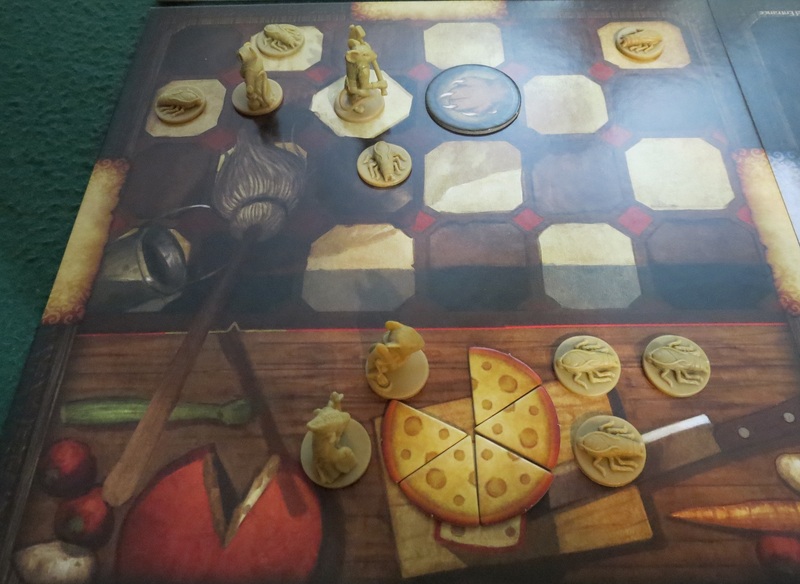 The dear cook is being attacked by roaches, and the situation is deliciously complicated: whenever the roaches eat some of Miz Maggie’s cheese, that cheese is transferred to the enemy stash, increasing the odds of even more baddies appearing. Worse, Miz Maggie is totally unaware of your team’s transformation from men to mice, so she’s going to swat your crew with the mop at about the same frequency as she’s smashing roaches. You can get her attention to put an end to her mouse-stomping, but you’re likely to pick up a few extra bruises (and fill the opposition’s stash with more wedges of cheese) before you do. Even later, after saving Miz Maggie and braving more tunnels, our heroic mice emerge into the courtyard, and must rush across to the old hollowed-out tree where Barksburg, city of mice, is located. Along the way, they’re hounded by more enemies… as well as the dastardly old crow who constantly swoops down to peck at them. It’s a tense finish to an already exciting chapter, and, barring rotten luck, your mice are going to barely make it. 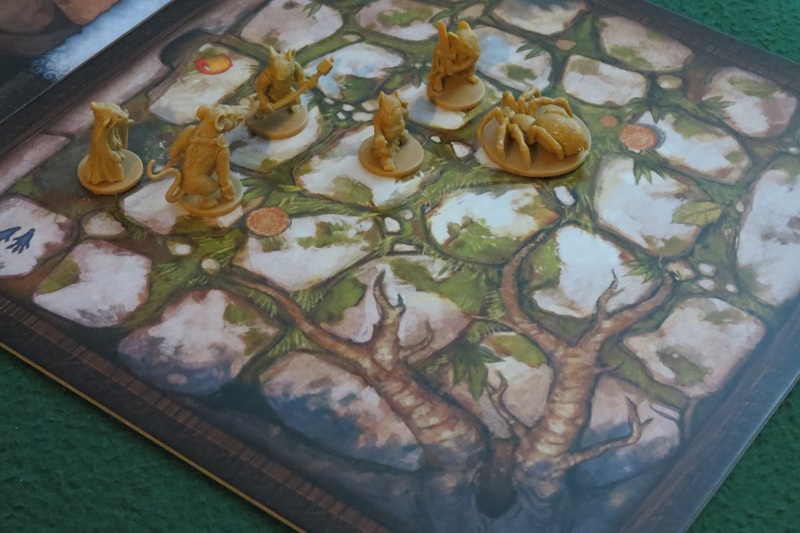 Somehow, Mice and Mystics hits an incredible balance sweet-spot. The chapters are tough, but nearly always end in a close victory. Maybe it’s the careful regulation of the cheese mechanic that always provides opportunities when you’re losing, or the way combat is more about dealing single wounds than heaps of them, but I can say I’ve never played a dungeon crawl with such immaculate balance. There are so many other things I could mention. How the skills are broad enough to let you tailor your party while still keeping them firmly rooted in class archetypes. How my persistent campaign is following Collin as he grows into a true leader, Filch redeems himself, and Nez becomes less of a bigot, both in terms of the narrative and the gameplay. I could go on for a thousand words about how affirming it is of virtues like courage and self-sacrifice, and how it’s probably precisely the type of story you want your kids growing up on. But I won’t, because Mice and Mystics is a thrilling journey, and those are things best discovered for yourself. Persuade your spouse you’re getting it for the kids. Posted on August 2, 2013, in Board Game and tagged Board Games, Mice and Mystics, Plaid Hat Games. Bookmark the permalink. 13 Comments. I’ve heard it plays well solo. Have you tried it solo, and if so, have you found that to be the case? Yes! It plays so well solo, in fact, that this was originally going to be an installment of Alone Time. In the end, I decided it fit more as a family-style game than a solo game, but it works very well either way. This review makes me want to play tonight at game night! Who’s with me?! Great write up. Count me among those that love this game. This is one of the few games that became a must own after I played it once. I saw this game on boardgamegeek.com and thought it looked like it would be worth acquiring, I’ll have to add it to my wishlist and trade list. Thank you for the interesting read. We love this game too, and I’ve played with my kids and their friends. The only point I’d disagree is in the balance. It’s TOUGH!! Our family has yet to finish Chaper 1 sucessfully in 6 tries. Any general advice on things you do to make it more efficient? Oh dear… I’m not sure what to tell you. My group blasted through chapter one pretty easily, and it wasn’t until a couple chapters later that we really got stuck. After a while we declared that chapter finished and moved onto the next, and then it eased up for us again. Pingback: Best Week 2013: Alone / Co-Op Time | SPACE-BIFF! Pingback: The League of Extraordinary GenConmen | SPACE-BIFF!